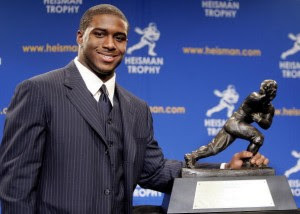 Earlier this month, Paul Pabst of The Dan Patrick Show tracked down the whereabouts of the Heisman Trophy that Saints running back Reggie Bush supposedly forfeited last year. Eventually, Pabst determined that the hard-to-find hardware was in storage at the San Diego Hall of Champions, and that Bush’s mother and stepfather, Denise and Lamar Griffin, had “loaned” the Hall of Champions the item in March 2011, months after Reggie supposedly had committed to coughing up the trophy. Now, SportsByBrooks.com reports that the Heisman remains at the Hall of Champions, that the Hall of Champions is no closer to returning the Heisman to Bush or his family, and that Bush has decided he won’t return the Heisman to the Heisman Trophy Trust. The fact that Bush recently spent the weekend in San Diego for a football camp and a cancer research benefit and didn’t take back the trophy and pack it in Styrofoam peanuts in a box bound for Manhattan seems to support the report. At some point, that never-returned Heisman could fetch a pretty penny on the open market. Which would go a long way toward paying the rent. Which got Bush, his family, and USC into their current predicament in the first place. But this is hardly about the money. This is about Bush and his family having the power to do whatever they want, from brazenly taking money and benefits while Reggie was still playing for the Trojans to stubbornly refusing to repay money that allegedly was provided under the assumption that Bush would hire the benefactors to be his agents to even more stubbornly refusing to completely settle the litigation spawned by the situation to even more stubbornly refusing to admit that which ultimately became obvious. All of which got Bush, his family, and USC into their current predicament in the first place. 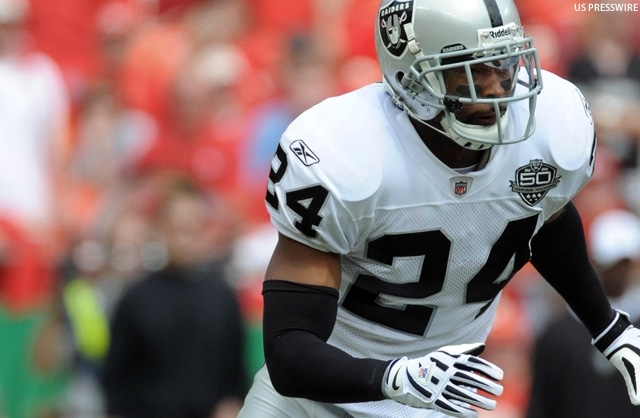 Raiders safety Michael Huff was mostly seen as a disappointment for the first four years of his career. The Raiders told Huff he was on the roster bubble as recently as 2009, but Huff’s play improved dramatically in 2010 in a contract year. Former Raiders captain Warren Sapp remembers Huff well from early in his career. Sapp said that Huff was often the last to practice and the first to leave. Huff is probably going to strike it rich this offseason. Perhaps he’s matured. But Sapp’s words make you wonder if Huff only grew up because free agency was around the corner. We wrote this morning that we’d be surprised if Terrell Owens didn’t try to come back from his torn ACL. By noon, his agent Drew Rosenhaus confirmed it. Rosenhaus told the Associated Press there has been no retirement talk despite a report that Owens told many people he was considering it. (The denial is to be expected.) Rosenhaus also revealed that the torn ACL occurred in early April on his left knee, although it’s somewhat unclear when he had surgery. 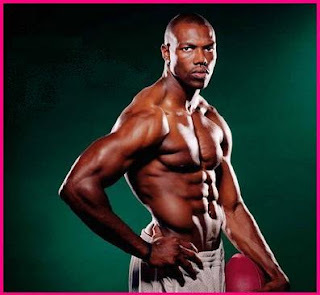 The most surprising statement: ”Terrell Owens will be ready and playing at the start of the season,” Rosenhaus said. We know T.O. showed amazing recovery skills before the Super Bowl against New England, but that timeline sounds almost impossible. Even if Owens was able to run routes again, he’d have to find a team confident enough in him to sign him before Week One. If Owens does return to the NFL, it makes sense to sign him after the opener when contracts are no longer guaranteed for the season. 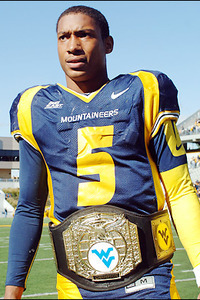 One player who was expected to make an impact at the next level was Pat White, who as the 44th overall pick matched current WVU athletic director Oliver Luck (father of Andrew Luck) as the highest-drafted quarterback in school history. In the end, the first college quarterback to win four bowl games made it through only one season, which ended rudely with Steelers cornerback Ike Taylor delivering a wicked helmet-to-helmet hit. They’ve now got another quarterback. We wish White well, and we hope that a guy for whom it always seemed to come easily will find a way to reverse a year of hard times. There has been plenty of public fretting regarding the possibility that workouts during the lockout will blow out a player’s ACL. Chris Mortensen of ESPN reports that it indeed has happened to at least one high-profile player. 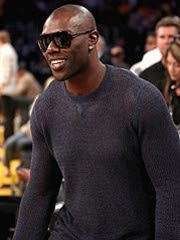 Per Mort, receiver Terrell Owens has undergone surgery to repair a torn ACL following an injury, previously undisclosed, that occurred earlier in the offseason. Owens suffered a knee injury in December, which resulted in surgery and placement on injured reserve. The ACL tear happened after the 2010 season ended; an unnamed source told Mortensen that the injury occurred while Owens was filming a TV show for VH1. The surgery, performed by Dr. James Andrews, occurred within the past months. Given a six-month recovery period, Owens would be able to play as early as November, if the surgery was performed in May. Owens will be a free agent once the lockout ends. 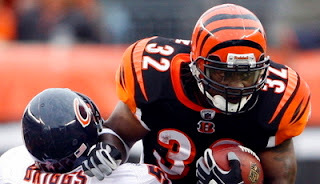 Given his age and his reputation for creating locker-room distractions (indeed, we’d heard that the Bengals had had enough of him before his season-ending injury), it’s hard to imagine Owens playing at all in 2011. And if he doesn’t play at all in 2011, he possibly won’t ever play again; Owens will celebrate (and celebrate it he usually does) his 38th birthday in December. Owens, one of the best receivers in league history, has played for the 49ers, Eagles, Cowboys, Bills, and Bengals. He is fifth on the all-time receptions list, second in receiving yards, and tied for second with Randy Moss in receiving touchdowns. The good news? While he won’t be able to build on his Hall of Fame credentials in 2011, he’ll have plenty of time to eat popcorn. Of the 16 teams that still take their training camps out of town, two of them (the Ravens and Jets) have decided to stay put this year. The other New York team, the Giants, has yet to decide whether to abandon plans to return to Albany, site of the team’s camp since 1996. Per Schwartz, camp is scheduled to launch July 30, and it’s due to break on August 21, three days before students return for fall classes. As we recently explained, it makes more sense this year to have training camps at remote locations, given that there will have been no offseason program and no communication with coaches during most of the time from March 11 until the end of the lockout, whenever it may come. Team building and male bonding will be at a premium; getting away from home and setting up shop in dorms will be the best way to set the tone for a regular season following a lost offseason. With the Ravens and Jets already announcing that they’re moving their training camps to their team facilities, and the Vikings announcing that they’ll follow suit if the lockout isn’t lifted by July 18, it’s reasonable for fans who make an annual pilgrimage to their favorite team’s camp to start to wonder if their team is next. If you’re one of the 200,000 or so who visit San Antonio when the Cowboys have their training camp there, you can be “cautiously optimistic” that you’ll get to see them again this year. The source said the Cowboys will “wait until the last minute to decide” whether they can start camp in San Antonio as scheduled on July 25. We’re still hoping the lockout ends soon enough that they don’t have to wait until the last minute. 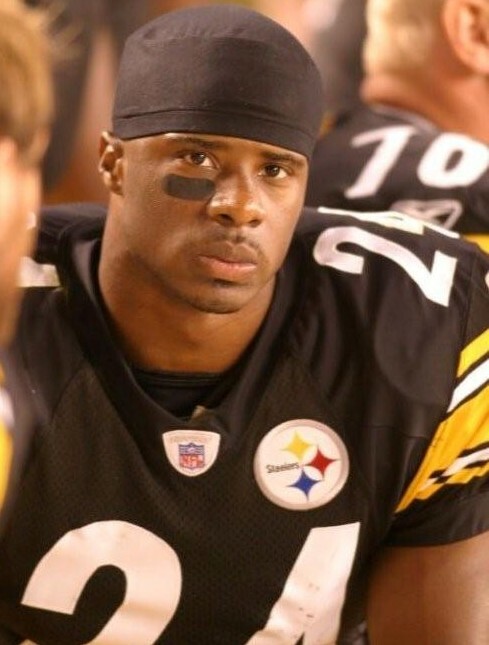 From time to time over the past several months, the Steelers deftly have tried to get the word out through the media that cornerback Ike Taylor will be staying in Pittsburgh. We’ve been told that Taylor plans to instead test the market once free agency opens, and Taylor himself later said he won’t give the Steelers a hometown discount. Since the Steelers rarely getting into bidding wars for free agents, especially then those free agents most recently played for the Steelers, Taylor seems to be resigned to the fact that his next contract will come from another team. With Champ Bailey re-signed by the Broncos and only a few big names hitting the market at the cornerback position (Nnamdi Asomugha and Antonio Cromartie) and plenty of team having to spend plenty of money to comply with the expected minimum cash requirements of the salary cap, Taylor could be in high demand. But he says he’s not thinking about how it will all shake out. Given that the time can’t even begin to be right until the lockout is over, here’s hoping that the right time is coming soon. Steelers quarterback Ben Roethlisberger says his foot injury was a serious problem for him last season. But not anymore. Roethlisberger considered surgery after the season but says rest has done the trick. Still, Roethlisberger says the foot injury is something that has stayed with him and might have to be surgically repaired eventually. The list of training camp sites to fall victim to the lockout is up to two. The Jets released a statement on Friday to let everybody know that they won’t be taking their show on the road to SUNY-Cortland for training camp this summer. 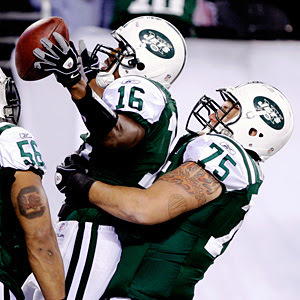 Assuming there is a training camp, it will be held at the Jets’ facility in Florham Park, New Jersey. The news comes a couple of days after the Ravens made a similar announcement and you can bet that other usual hosts of NFL camps are bracing themselves for bad news. Teams need several weeks of lead time to get all the equipment and material needed to hold training camp to offsite facilities and the uncertainty about when and if camp will be held is going to make it difficult for any team to follow normal procedures. The Jets have held camp in Cortland in each of Rex Ryan’s two seasons as head coach. Hofstra University on Long Island hosted Jets camp for the 40 years before Ryan’s arrival and the team held some workouts there last summer as well. Sixteen teams went away for training camp before the 2010 season. There will be a lot less this summer unless the lockout ends in the next couple of weeks. As we draw closer to a labor agreement, we also get closer to free agency and that means it is time to start discussing who will land where when the league gets back to business. The Jets will likely be one of the busiest teams once that day comes. Not only are they annually active buyers, this year also finds them with several free agents of their own. 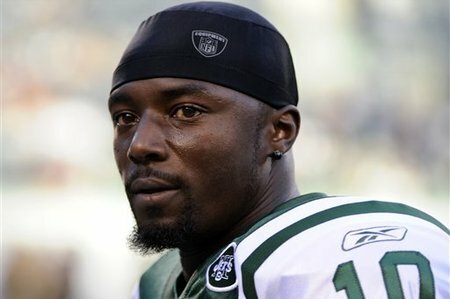 Antonio Cromartie, Braylon Edwards, Santonio Holmes and Brad Smith highlight the list and Jason LaCanfora of NFL.com is hearing that Holmes will be the first guy they try to keep in the fold. LaCanfora isn’t the first guy to indicate Holmes is the number one priority for the Jets and there’s good reason to believe that all this smoke is coming from a real fire. Holmes is a more versatile receiver than Edwards, he’s more consistent and is a year younger. 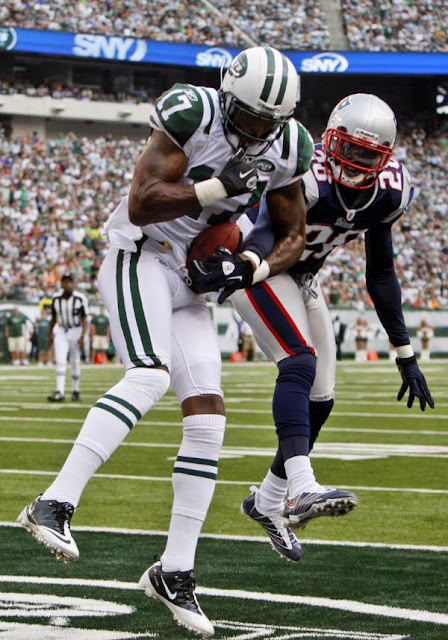 Holmes had 52 catches for 746 yards and six touchdowns in 12 games for the Jets in 2010. He missed the first four games because of a drug suspension and added nine more catches for 127 yards and two scores during their run to the AFC Championship Game. Thanks to the deals in place for Ferguson, Mangold and Revis, as well as the franchise tag hung around David Harris’s neck, the Jets likely won’t have enough cap space to ink all their free agents. Smith has seen the writing on the wall and it would seem that Cromartie would be the team’s second biggest priority, which should leave Edwards looking for work elsewhere once we finally get football back. Jets quarterback Mark Sanchez has organized several throwing sessions with his teammates during the lockout, but he doesn’t know if they’ll be his teammates after the lockout. And one of those teammates, for now anyway, says that makes things difficult. Jets (for now) receiver and return man Brad Smith says that for the three receivers who will become free agents — himself, Santonio Holmes and Braylon Edwards — it’s weird to be catching passes from Sanchez now without knowing whether they’ll be catching passes from Sanchez when the season starts. Smith says he’d still like to be a Jet, but he’s also going to do what’s best for himself “in the interest of business.” Which probably means he’ll be catching passes from a quarterback other than Sanchez when the player-organized workouts are over and training camps begin. As the Buffalo Bills prepare to unveil on Friday night their new uniforms, which already were inadvertently disclosed by the folks at EA, the team’s official website tells the tale of why the team changed in the 1980s from white helmets to red helmets, which apparently will be changed on Friday back to white. Per Chris Brown of BuffaloBills.com, quarterback Joe Ferguson was color blind. So with four teams in the AFC East having white helmets at the time (Pats, Dolphins, Bills, Colts), Ferguson was struggling to separate receivers from defenders. 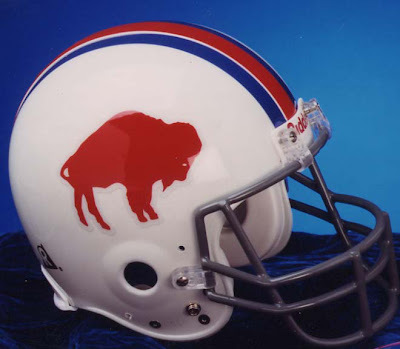 With the Bills apparently going back to white helmets, a color-blind quarterback in the AFC East will once again have trouble. Though the Colts are gone and the Pats have switched to silver, the Jets have traded green helmets for white and the Dolphins fortunately have never switched from white to aqua or circus peanut orange. The lockout hasn’t ended soon enough to save the Baltimore Ravens’ plans of holding training camp at McDaniel College, where the team has had camp every year since it first moved to Baltimore and became the Ravens in 1996. Instead, the Ravens will have camp at their facility in Owings Mills. Last year more than 110,000 fans attended Ravens training camp. But the Ravens’ facility in Owings Mills doesn’t have the space for fans, and so this year’s training camp will be closed to the public. 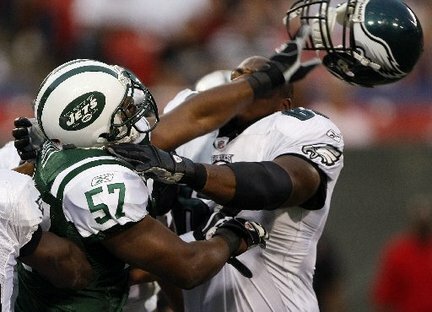 New York Jets linebacker Bart Scott is known for his brash, aggressive nature on the field and sometimes during interviews. 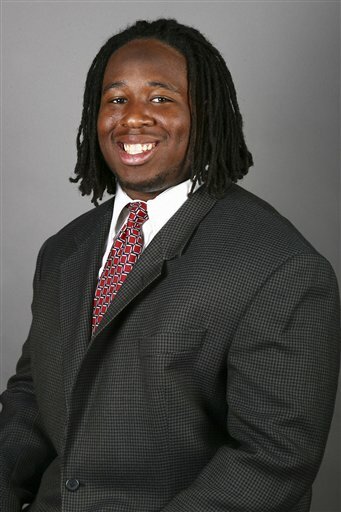 He's also got a big heart and has a soft spot for paralyzed Rutgers football player Eric LeGrand. LeGrand was injured during a kickoff against Army. Now, he attends classes in a wheelchair. And Scott told NFL.com that he plans to donate the proceeds from his "Can't Wait" clothing line to the "LeGrand Believe Fund. "I've never met him but I heard he's a great kid," Scott said. "He has a lot of concerns and needs right now, but I know someday he will walk, and that's something I can't wait for. ..
"I want to do something for him, to help him. I hope we'll sell out the shirts quickly so we can get the money to him because things are expensive with his care, and I know there are money needs. For instance, he needs to refit the doors at his house for his wheelchair." For Scott, LeGrand's condition hits close to home because his cousin is a paraplegic after being struck by a random bullet in Detroit. "I want to be able to see him lead his team on the field someday," Scott said. "That's something I'm looking forward to and I just hope to help him get there." Author: The National Football Post - Aaron Wilson covers the Ravens for the Carroll County Times. 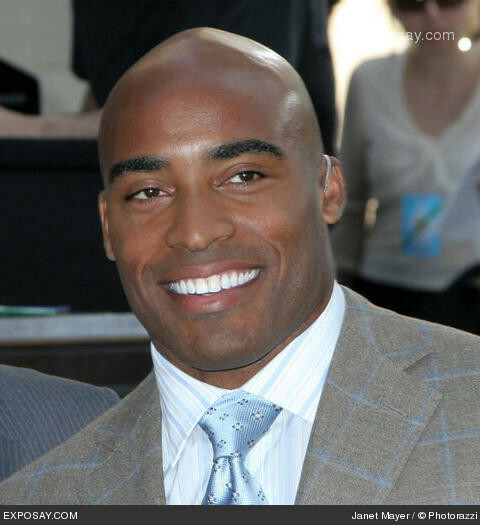 Fresh off his appearance Tuesday night on HBO’s “Real Sports,” Tiki Barber took to the airwaves in New York, appearing on WFAN with Mike Francesa. The interview, which was transcribed by the fine folks at sportsradiointerviews.com, got a little testy at times. Actually, it got a lot testy before returning to discussion of Barber’s intent to make a return to the NFL at age 36 after four seasons out of the league. Francesa asked whether Barber’s failed television career was an impetus for him to put on the pads again. He also asked him point-blank if money was the motivation for him jumping back in. “No, that’s the simple answer Mike,” said the former New York Giants star. “A lot of people get caught up in ‘Oh, he needs a job, he’s going through a divorce, he needs money.’ But it’s not about that. It’s a redemption for me. I need to be successful at something, and something I’ve always been good at is playing football. I know I have the physical ability to do that, I know I have the mental ability to do it. Then, Francesa asked if Barber’s bust out on NBC’s “Today Show” was the driving force behind his decision. Francesa then insisted that his failed television career has to be part of the discussion in him resuming his football career. Jones-Drew agrees NFL needs to be in L.A.
During his recent appearance on NFL Network’s Total Access, Jaguars running back Maurice Jones-Drew’s comments weren’t confined to his opinions on adding a high-profile wideout and his support for quarterback David Garrard. Jones-Drew, a California native who played college football at UCLA, believes that the time has come for the NFL to return to L.A. It also sounds as if Jones-Drew wouldn’t mind playing in L.A. himself. “To come back home to play in front of my family, so they don’t have to travel 2,000 miles to see me play, that is something I would love as well,” Jones-Drew said. Before Jaguars fans begin breathing into the paper bags that in some years they choose to wear on their heads, Jones-Drew also said he loves Jacksonville. And, as a practical matter, by the time the Jags or any other team moves to Los Angeles, Jones-Drew likely will be done playing, or close to it. Still, it seems inevitable that the NFL will return to L.A. The only questions are when, who, and how many teams. Our belief that keeping the lawyers away from the process can only speed up a resolution to the lockout may have been bolstered by one of the lawyers himself, as the league’s chief negotiator, Jeff Pash, indicated today that he expects to have plenty of work to do before the lockout ends. Asked how close an agreement is, Pash wouldn’t say the end of the lockout is near. Pash did say, however, that the NFL remains committed to spending whatever time it takes to get it done. 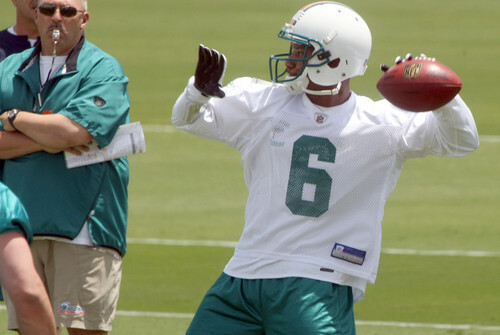 Vince Young has been the forgotten man of the quarterback carousel speculation this offseaon. It’s not because of his play. Young has a lot to work on as a quarterback, but he’s flashed plenty of playmaking ability and production during his career. Young scares decision makers because of, well, everything else. Len Pasquarelli of the Sports XChange writes that a few teams are “investigating rumors [Young] may have mishandled his money” and are worried about his perceived lack of maturity. Mishandling money would hardly be a unique issue for a top-ten pick, so a deeper investigation could indicate a larger problem. We went back and watched Young’s snaps from 2010. It wasn’t all perfect, but his play on third downs and his ability to fit the ball into tight windows was impressive. Take away the baggage, and he’d easily be the top name available this offseason. If only getting rid of the baggage was so easy. 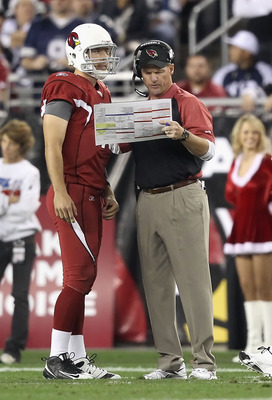 Cardinals coach Ken Whisenhunt doesn’t just want a quick fix at quarterback when the lockout ends. He’d love to acquire a player to truly build around. “If you had a chance to get a young quarterback you think could develop into a great player for you for a decade, as opposed to a veteran player you think could come in and help you right now, you’ve got to go with your evaluation and the player you have rated higher,” Whisenhunt said on Sirius radio with Adam Schein and Rich Gannon, via AZCardinals.com. “Let’s say your number one [-rated] player is a player you think can help that position for a long time to come, you’ve got to take that shot. 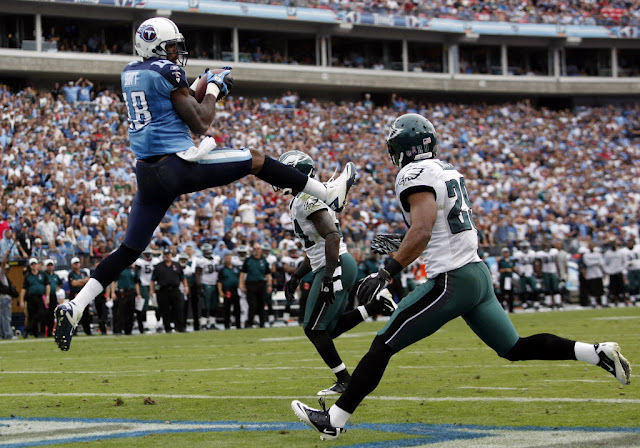 It’s hard to find a guy to play that position in this league,” Whisenhunt said. Folks could read into that statement a pro-Kevin Kolb sentiment, since Kolb sounds more like a long-term bet than Kyle Orton. We tend to think that Whisenhunt wouldn’t give away much of anything in a national interview, and we’re all just bored by the lockout. 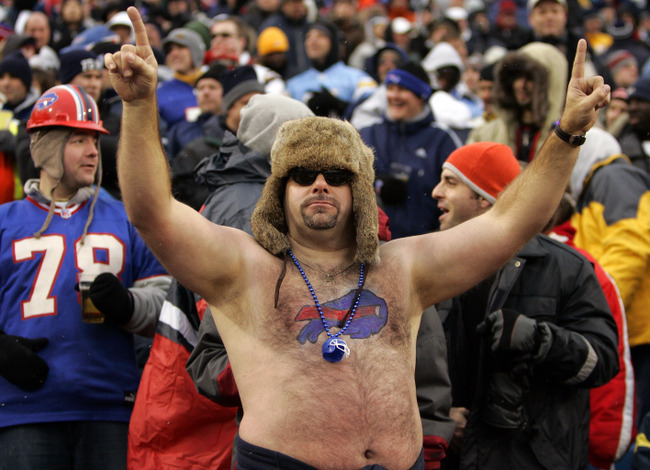 Bills fans should be nervous about losing their team to L.A. Some viewed the recent decision of AEG’s Tim Leiweke to list five teams other than the Buffalo Bills as candidates for a purchase-and-pack-it-up transaction as a reason to believe that the Bills won’t be targeted for relocation to Los Angeles. Count Jerry Sullivan of the Buffalo News as among those who view the development as a good sign. There’s a good chance, however, that the glass is in reality much more than half empty. With Albert Breer of NFL Network pointing out that, in reality, AEG has been communicating regularly with more than five teams, the Bills become the odds-on favorite for the role of Team No. 6. And No. 6 could be No. 1. Leiweke isn’t stupid enough to publicly out the teams that he believes are the best candidates to be available to be bought and then moved. Instead, it’s more likely that Leiweke’s list consists of teams that he knows AEG won’t be buying and moving; thus, he had no qualms about putting those five franchises in a delicate position in their current homes. Indeed, the latest tweak introduced by Leiweke — AEG owner Philip Anschutz’s desire to acquire majority interest in the team that moves to L.A. — reduces dramatically the potential universe of franchises that could be moved, since the first hurdle would be a willingness by the current owners to sell. So if the Raiders and Chargers and Rams and Jaguars and Vikings aren’t for sale, then they won’t be the first tenants of the stadium that has a name but at this point not much more. The Bills, on the other hand, eventually will meet both of the primary criteria for landing in L.A.. Even if the highest bidder has Buffalo roots, long-term earning potential will be much greater in Los Angeles. Thus, the best hope for Bills fans would be a willingness to support a full-time move to Toronto, with maybe a game or two per year played in Buffalo. That strategy presents two possible problems. 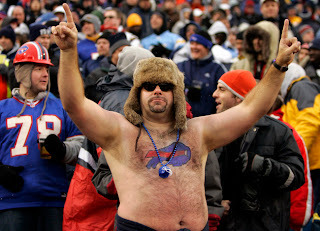 First, if the Bills are going to leave Buffalo, most fans would prefer that they leave. If a guy is going to lose his wife, he’d prefer that she move in with a man who lives in another state, not in another house in the same neighborhood. Second, Toronto will want its own team, not one to which the folks in Buffalo can claim partial ownership. Regardless, unless and until someone steps up with a willingness to buy the Bills and a stubborn belief that the numbers will work in a shrinking market, the Bills will be one of the most likely teams to be targeted by AEG. The fact that Leiweke specifically avoided opening a Western New York can of worms when trying to build some buzz in his backyard should make folks in Buffalo even more skittish about how this could eventually play out. 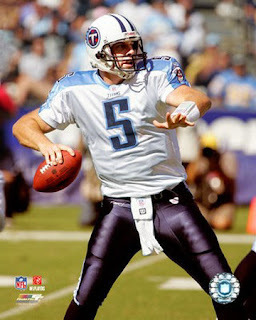 Kerry Collins would love to return to the Titans. The 39-year-old thinks Jake Locker could learn from him, but don’t take Collins the wrong way. The Titans are in a tricky spot. Of the rookie first-round quarterbacks, Locker may be the least ready to start in Week One. Bringing back Collins makes some sense, but we think that they will first aim for someone a little younger like Matt Hasselbeck. Collins fits better as a true backup at this stage, not as the potential starter for the majority of the season. There has been a lot of dissection of Dononvan McNabb’s year gone wrong in Washington during the lockout because, well, we don’t have a lot else to talk about. 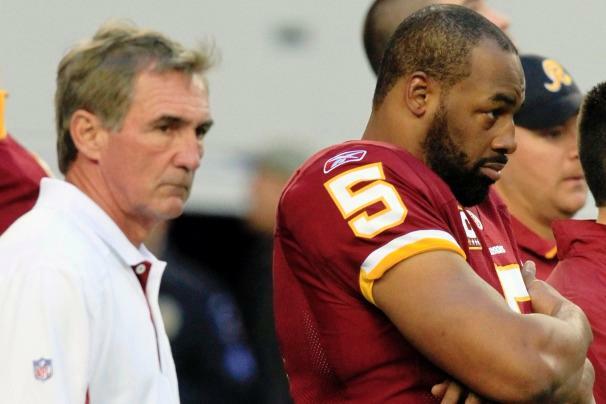 Whether the guy likes wristbands or not, the trade for McNabb just didn’t work in 2010. But that hasn’t changed G.M. Bruce Allen’s mind that it was the right move. 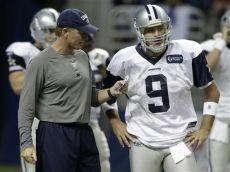 Allen says it takes time for a new staff and quarterback to grow together, but made no promises about McNabb’s future. Allen insists he appreciates Donovan as a player and disputed the idea that McNabb didn’t work well with offensive coordinator Kyle Shanahan. 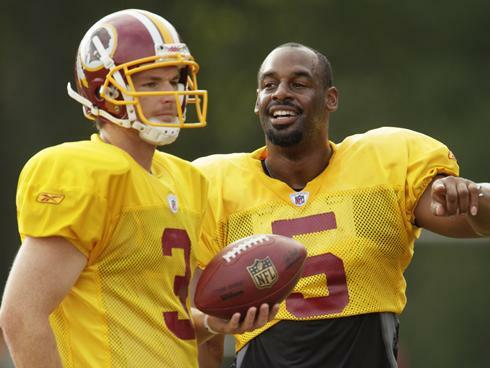 The McNabb trade set the Redskins organization back. They gave up a second- and fourth-round pick for him. They paid McNabb roughly $15 million last year, including a $3.5 million signing bonus in November after they benched him. And once this lockout ends, they are expected to quickly say goodbye. When writing Houston’s post lockout checklist on Friday, I considered including backup quarterback as an area to look at. Dan Orlovsky is due $2.75 million in 2011, but he stayed ahead of Matt Leinart all last year. Kubiak seems to like Orlovsky enough and the post was getting too long, so I just ignored the position. Apparently the Texans are open to bringing Leinart back. John McClain of the Houston Chronicle writes the team “would love” to do just that. McClain just doesn’t see the scenario as particularly likely. “Leinart wants to play for a team that’ll give him a chance to start. I see him being reunited with Pete Carroll,” McClain writes. We doubt that chance to start is out there. And while the Texans “would love” to have Leinart back, it would probably be for a third quarterback’s salary. They’d let him compete with Orlovsky. Leinart wants a better opportunity than that. But are we sure that a chance like that is out there, even from Carroll? Teams weren’t exactly beating down Arizona’s door when Leinart was made available early last September. 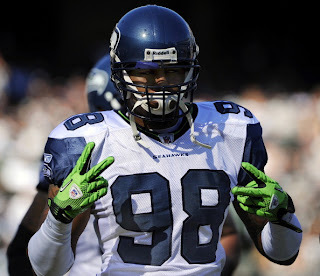 The Seahawks didn’t go after Leinart when he was cut. We’d guess that Leinart is viewed no differently than a David Carr-type at best by most teams. He’s an option to be your backup, but it would be stunning if Leinart convinced a coach he was “The Guy” in training camp. It’s possible Leinart won’t get a better opportunity than returning to Houston. It looks like another comeback from shoulder surgery isn’t going to happen for Chad Pennington. At least not this year. Pennington tells Rich Stevens of the Charleston Daily Mail in West Virginia that he’s going to work in television. Pennington isn’t officially retiring and it’s unclear what his role will be at Fox. He may see how his shoulder is doing in 2012, but another run at a comeback player of the year award didn’t make sense after he tore his ACL playing basketball in March. “I planned to make a fourth comeback, but it doesn’t make sense to try to rehab a shoulder injury a fourth time on top of an ACL injury. I’m at a point of my career where I haven’t been patient before, I’m going to be patient now,” Pennington said. One of the more interesting guys to listen to as a player, we suspect Pennington will excel in his next career with a microphone. When he last made an appearance on the NFL stage, Seahawks defensive end Raheem Brock was crank calling the Commissioner with teammate Chester Pitts. This time around, the joke is on Brock. According to MyFOXPhilly.com and Philadelphia Magazine, via TheBigLead.com, Brock has been arrested for walking out on a $27 check at the Copabanana. Brock was charged with theft and resisting arrest, and he was released Friday morning without bail. Here’s hoping that, for his jailhouse phone call, Brock didn’t call the Commissioner again. Kyle Orton, who has frequently been rumored as a possible trade target for the Cardinals, joined Larry Fitzgerald’s famous workouts in Minnesota on Thursday. The picture to the right also including Broncos receiver Eric Decker was taken by Fitzgerald. He apparently said he’s known Orton for a while, so don’t read too much into things. We won’t fall for that trap. Clearly, a picture of two friends working out together is a sign that Fitzgerald is covertly working as the Cardinals G.M. 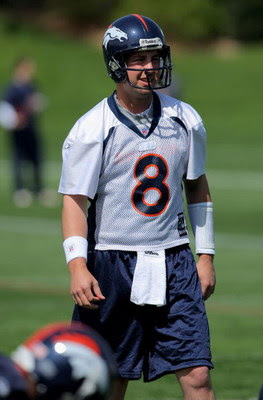 and has worked out a trade for Orton in exchange for Derek Anderson, a third-round pick, and a bag of footballs. Case closed. After the Saints traded up to pick running back Mark Ingram at the bottom of round one and running back Reggie Bush bid (bade?) farewell to New Orleans on Twitter, speculation mounted that Bush eventually would be leaving the Saints. But just as it appeared to be a foregone conclusion that Bush would be gone not long after the lockout ends, Bush publicly declared that he hopes to remain with the team indefinitely. And we definitely aren’t buying it. Jeff Duncan of the New Orleans Times-Picayune reports via Twitter that Bush showed up for none of the team’s six weeks of lockout workouts. As in not one. Moreover, Bush could have come to the workouts without fully working out, doing basically the same things at Tulane University that he is doing on his own, while also continuing to demonstrate to his teammates that he intends to continue to be a member of the team. Bush admits that, given his contract, “me, my agent and the Saints have to collectively come together to talk . . . and just come to a meeting point — a happy medium — because obviously there’s going to have to be some type of pay cut.” And he can take the high road by claiming he wants to stay with the Saints. And then he can decline whatever bottom-line offer the Saints make, forcing the Saints to cut him or risk owing the full $11.8 million, if he’s injured during training camp or the preseason. Either way, if Bush refuses to reduce his pay to the level the Saints are offering, the Saints will cut him before the start of the regular season. Thus, he can pretend that he wants to stay in New Orleans, while figuring out his next move after the Saints let him go. Though his failure to show up for the Saints’ lockout workouts doesn’t constitute definitive proof that he wants out, it’s safe to say that, if he truly wanted to be a Saint in 2011, he would have been with his Saints teammates during at least one day of their lockout workouts. Starting at guard for the Washington Redskins during Thursday’s players-only practice: Quarterback John Beck. At cornerback: Some random dude in the crowd. Shemar Woods of the Washington Post notes that London Fletcher asked a small group of fans watching their workout Thursday if they were ready to suit up. Only one of them, 28-year-old Josh Richards, was prepared for the moment. 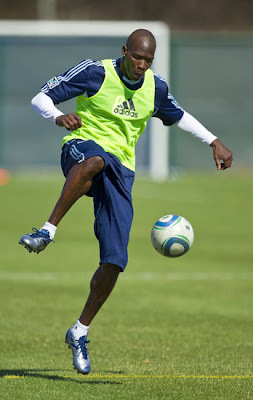 Richards put on his cleats and participated in the team’s individual drills. Richards assisted the players setting up cones, and jumped into an interception drill, dropping only one pass on the first go-around. He said he played high school football and his favorite team was the Redskins, so the workout was a huge thrill. The Virginia Destroyers of the UFL annouced via Twitter Thursday that White is close to signing a deal with the team. He’s expected to make it official in the next few days. White appeared to lose interest in football in 2010, and briefly flirted with a minor league baseball career. The Destroyers call him “QB” Pat White, so they will presumably use him behind center and not at another position. The Bengals have made it clear that bringing back Cedric Benson is a top priority. While Benson believes he deserves a big deal, it sounds like the feeling is mutual. Benson has been a surprise participant at Cincinnati’s player-only workouts, according to Joe Reedy of Cincinnati Enquirer. He’s seen the team’s new offensive playbook and says he likes that Jay Gruden’s scheme has more downhill runs in it. Even though he’s unsigned, Benson is sounding like a guy that plans to be back as a centerpiece in an otherwise changing offense. After 10 seasons with the Seahawks, Matt Hasselbeck seems poised to leave whenever the lockout ends. But he would prefer to stay. Hasselbeck said today that he’s hoping for the best but preparing for the worst regarding whether the Seahawks brass is going to send him packing and make Charlie Whitehurst the starter for 2011. Hasselbeck noted that he and new Seahawks offensive coordinator Darrell Bevell worked together in Green Bay in 2000 and said he’d like to work with him again. Ultimately, Hasselbeck seems to know that with a team that wants to get younger, a guy who’s turning 36 in September has tough odds to stick around. 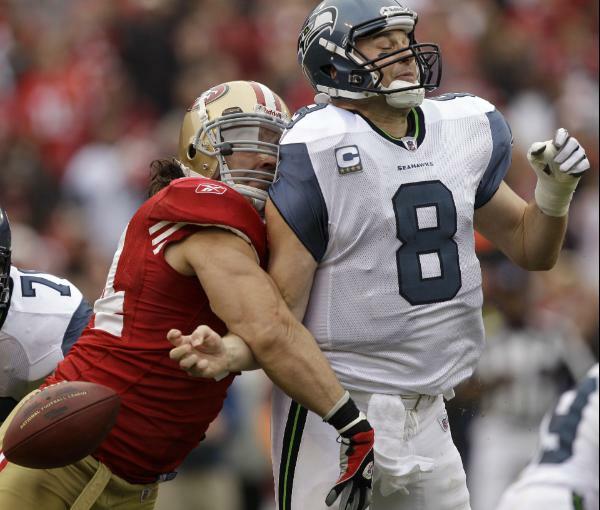 The Cardinals, Titans, Dolphins and Vikings are among the teams that have been named as potential landing spots if the Seahawks decide to dump Hasselbeck. The offseason of John Beck continues. 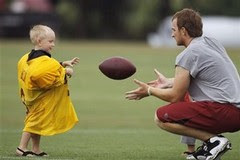 Beck led the charge Tuesday as 31 Redskins gathered to practice, and he brought a friend with him. Beck enlisted a buddy to stand on top of the bleachers and videotape the practice, so Beck (and presumably others) could watch the session later, according to Ryan O’Halloran of CSNWashington.com. That’s the not the only tape work Beck did. The presumptive Redskins starter cracked up the Redskins media when he told them he’s been researching his new rookie teammates by watching their highlights on YouTube. “You can watch all these guys. I had no idea Evan Royster was the leading rusher in Penn State history. Today, I was like, ‘Hey man, congrats, that’s pretty sweet. I had no idea.’ It’s cool to learn about your because everybody has a story and they’ve all worked hard to get here,” Beck said. We’re still not completely convinced Beck is going to be the starting QB for Washington in Week One. If he’s not, perhaps he could be the video coordinator. In an interview with ESPN’s Stephen A. Smith, about which we’ve already posted a couple of blurbs, Burress rules out playing for Giants coach Tom Coughlin. Specifically, we’ve heard that Burress was fined upwards of 50 times in 2008 alone for a variety of infractions. In contrast, Burress spoke glowingly about his relationship with former Steelers coach Bill Cowher. And that means it could make sense to keep an eye on teams coached by men over whom Cowher has influence, such as the Cardinals and Ken Whisenhunt, and the Bills and Chan Gailey. It also could make sense to pay even closer attention to the Steelers, given that offensive coordinator Bruce Arians served as Plaxico’s position coach in Pittsburgh. 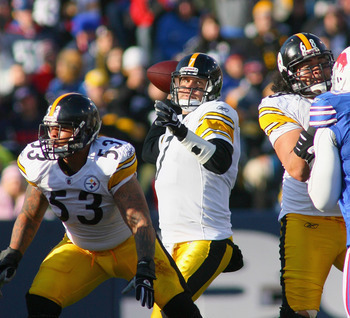 Given quarterback Ben Roethlisberger’s stated desire for tall receivers and Roethlisberger’s close relationship with Arians, an effort to bring Burress back to the ‘Burgh could be in the offing. Regardless of where he lands, Burress plans to make an impact, promising that the league will be in for a “rude awakening” when he returns. The New York Jets are not expected to fight to re-sign impending free-agent WR Braylon Edwards if other teams show interest in him when free agency begins. Not a huge surprise here. And don't discount the negotiating angle on this. Clearly, the Jets have a good financial reason to act disinterested. 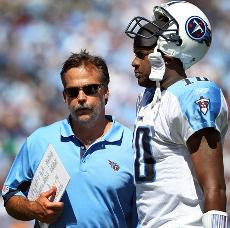 Tennessee Titans WR Kenny Britt is being sought by Nashville police in connection with two outstanding warrants against Britt. He allegedly made inaccurate statements on his driver's license applications on at least one occasion.Britt is expected to turn himself in once returns to Nashville. Britt's legal problems are like the heads of Hydra. One goes away and two pop up in its place. He is a decent buy low in dynasty if he is going at bargain basement prices, but Britt clearly hasn't "gotten the message" and comes with a ton of risk. 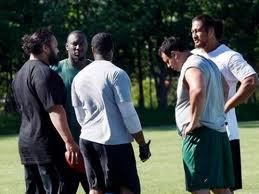 NEW YORK -- Mark Sanchez and his New York Jets teammates are back together again. Sanchez and about 40 other players started practicing at an undisclosed location in New Jersey on Monday, a person with knowledge of the workouts told the Associated Press. The player-run practices, organized by Sanchez, will go through Wednesday and include offensive and defensive players. The person spoke on condition of anonymity because the players want the sessions to remain private to the media and public. None of the players, many of whom are on Twitter and Facebook, even let on that they were planning to meet as a full squad. Several NFL teams have gotten together on their own in recent weeks because the players are not allowed to train at team facilities because of the ongoing lockout. Teams normally would be preparing for minicamp workouts now. 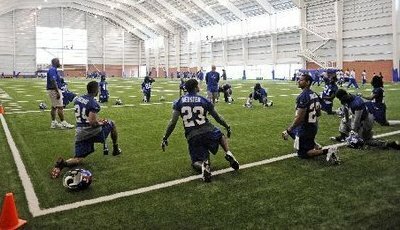 The Jets' workouts were first reported by ESPNNewYork.com. Sanchez ran a camp for the Jets' quarterbacks, wide receivers and running backs -- dubbed "Jets West" -- in Mission Viejo, Calif., in early May. He said during a recent in-studio appearance at NFL Network that he had planned to gather the entire team together at some point this month if the lockout continued. Some of the team's defensive linemen, including first-round pick Muhammad Wilkerson, started working out together nearly two weeks ago at a high school field in New Jersey to go through position drills. Nose tackle Sione Pouha said during the first workout on June 2 that "if Mark makes the call, we're there." The lockout is providing NFL players plenty of time to pursue other interests. 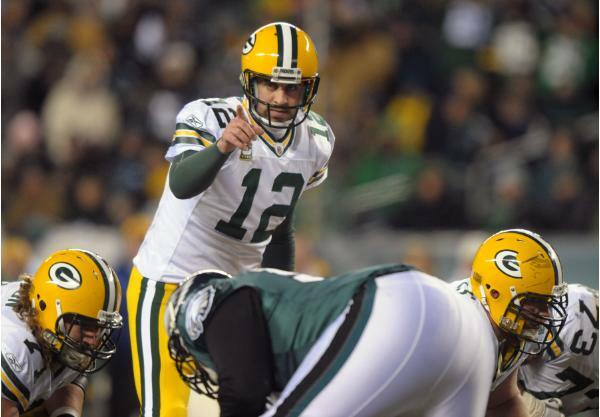 For Packers quarterback Aaron Rodgers, those other interests include starting a record label. Rodgers has launched Suspended Sunrise Recordings, and the company is working with a band known as The Make, which has its roots in Rodgers’ hometown of Chico, California. Or maybe Rodgers is just looking for a tax write-off. If he isn’t, there’s a good chance that he nevertheless has found one. Time and money heals all contract-related wounds. And as time wears on with All Pro guard Logan Mankins still in the Patriots organization, the more likely it appears he could stay with the team a long time. Mankins sounded more open to staying with the team recently. 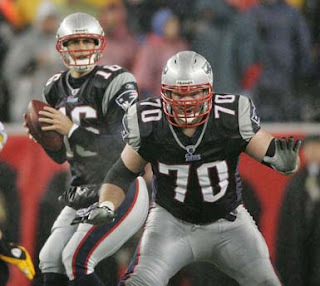 And Patriots coach Bill Belichick was on NFL Network Sunday night singing Mankins’ praises as the No. 39 player in the league. “There are tough players and then there are the super tough guys. I’d say Mankins would go into that [second] category. Both physically and mentally, he’s as tough as they come,” Belichick said via ESPNBoston.com. As we noted earlier Monday, everything Belichick does through the press is well thought out. Belichick could have presented other Patriots on the list, but he wound up with Mankins. “You could honestly pick out any one of 30 plays of him in any game and find him really dominating guys,” Belichick said. Belichick knows Mankins’ value. That’s why the team is willing to pay him more than $10 million this season, and why we suspect a long-term deal will happen eventually despite all the drama that has happened between the two sides. When it comes to the safety position, Gene Smith said there's no question the Jaguars very much need to get better. And what's more, they need to do it in a hurry. Smith, in his third season as the Jaguars' general manager, said the play of the entire defensive secondary – and indeed the entire defense – is interconnected, and sub-par play at one position can have a weakening effect on another. Smith said this season is the time for safety to stop being that component. “We need to get stronger down the middle of our defense,” Smith said. Smith spoke candidly about the position's struggles last season during a recent interview with jaguars.com for this story on the team's safety position, part of a position-by-position series that will end this week. Smith said the team likely will sign one player – maybe two – in pro free agency who will compete for a starting position. While pro free agency typically begins in March, it has been delayed this season because of the ongoing labor issues/lockout between owners and players. “We need more playmaking,” he added. Such plays were lacking a lot of times last season. The Jaguars, who finished 28th in the NFL in total defense last season – 28th against the pass and 22ndagainst the run – started five different players at the safety position in a season-long effort to find consistency at the spot. 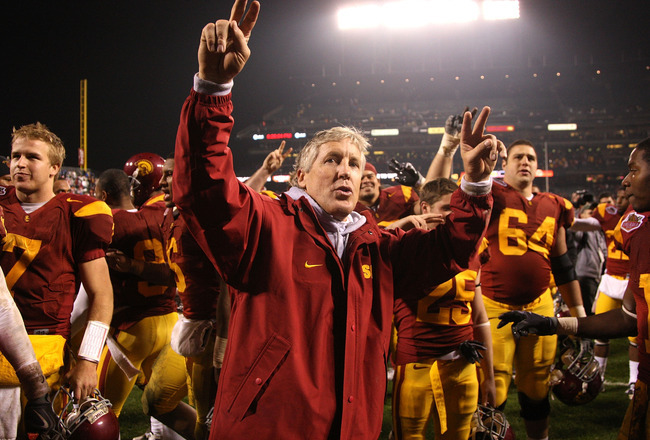 Former USC coach Pete Carroll, who left for the Seahawks (or, as the case may be, escaped) only a few months before the NCAA hammer came down on the program, had yet to publicly address the decision to strip the Trojans’ 2004 BCS national championship. He finally has broken his silence. And it’s safe to say that the paperback version of Win Forever won’t have any asterisk or subtitle relating to the “Forever” having only a seven-year shelf life. Still, that same thing could be said by any coach whose team has a title taken away after the fact. The outcomes of the games can’t ever be changed, and the inclination of the players to stubbornly adhere to the information displayed on the scoreboard will only be strengthened by a proclamation from their head coach that, essentially, it’s OK to ignore the eventual consequences. Carroll also bemoaned the fact that the process took so many years to unfold, and that the kids currently at USC are paying for the alleged sins of their predecessors. On this point, Carroll has a good point; the NCAA often takes too long to sift through these cases, in large part because the NCAA’s lack of subpoena power often makes proving violations harder than eating corn on the cob without teeth. Indeed, but for the lawsuit against Reggie Bush that Bush stubbornly refused to settle, the NCAA would have been unable to ever gather enough evidence to support a conclusion that Bush had forfeited his eligibility by accepting benefits. So, yes, the process desperately needs change, in many ways. But the inefficiencies of the NCAA don’t justify a refusal to accept reality, even if reality arrives far later than it should have. Despite speculation from Titans guard Jake Scott, Kerry Collins sounds interested in possibly being a nursemaid mentor to Jake Locker. That doesn’t sound like a guy with many reservations about returning. Collins is staying in shape and has a relationship with coach Mike Munchak, which helps his chances. We just wonder if the Titans want someone a little younger that could start for much of the season if Locker isn’t ready. Collins also wants to make sure he meshes with Locker. Translation: I’d like to work with a kid that listens. “If it makes sense on both sides to do it, I’d be good for coming back,” Collins said. 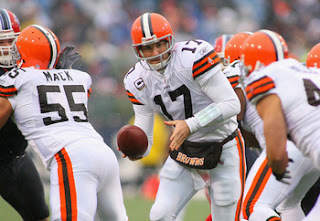 Colt McCoy is the Browns’ projected starter, and Seneca Wallace was re-signed in March to back him up. 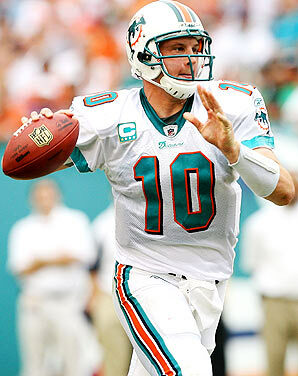 Delhomme, 36, threw two touchdown passes and seven interceptions in five appearances last year. Dating back to the 2008 playoffs, he has a beyond ugly 11:30 TD-to-INT ratio. 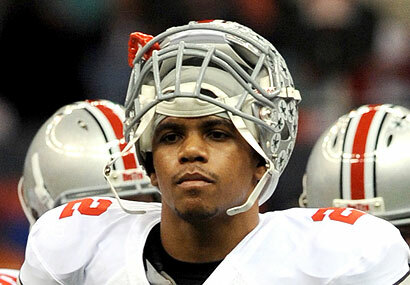 COLUMBUS, Ohio (AP)—The next step may be the most important one for former Ohio State quarterback Terrelle Pryor. Done with college football and through with talking to the NCAA, now he’ll have to convince NFL teams he can fully realize the potential that he has shown since he was a high school quarterback in Pennsylvania. AP - Jun 8, 5:59 pm EDT NCAAF Gallery “He’s definitely looking at the supplemental draft,” James said. The “all of this” Brandt was referring to is the smoking rubble at Ohio State: coach Jim Tressel’s forced resignation, an ongoing and all-encompassing NCAA probe and, on Tuesday night, Pryor’s announcement that he wouldn’t return to school and play his senior season. Pryor, considered the nation’s No. 1 quarterback recruit when he signed with Ohio State in 2008, had already been suspended for the first five games of the 2011 season for trading autographs and memorabilia for cash and discounted tattoos. The NCAA also is looking into the cars Pryor has owned or was loaned while at Ohio State. Investigators left campus last week, Ohio State President Gordon Gee says, but the probe will continue ahead of an Aug. 12 meeting between OSU officials and the NCAA’s committee on infractions. “They’re not going to give him or any other student-athlete any due process rights to speak of, so he’s moved on,” James said. The Saskatchewan Roughriders, who held Pryor’s Canadian Football League negotiating rights, made a play for him Wednesday night. The CFL game is played on a field both longer and wider than the NFL’s, meaning a mobile quarterback is a precious commodity. If a team were to pick Pryor later this summer, it would surrender the corresponding round’s pick in the regular draft next spring. “The big question I think everybody wants to know is, can he play in the NFL? Yes. But there’s got to be some growth, certainly, from a fundamental standpoint and a maturity standpoint,” he said. “From what I can see of the NFL game there are a lot of progression-type reads where you have to see the whole field. And that takes a special quarterback,” Frey said. “What happens with guys like him, we get players who are 17 going on 22,” Brandt said. But that doesn’t explain his Ohio State numbers: 2,164 rushing yards, 6,177 passing yards, 57 touchdown passes and two BCS bowl game MVP awards. Pryor’s high school coach, Ray Reitz, has no question that he will make it. “I hear all these analysts say he’s a project. He’s this. He’s that,” he said. “That’s all paper talk. Put him out there and see if 31 teams don’t want him.